Said El Hadi, director general of TMSA: “Tangier-Med project aims to position Morocco as a logistic platform for the European market. A number of government officials, along with businessmen and journalists attended the meeting. The workshops of the study day were coordinated by Dris Aissaoui, Editor in Chief of the Arabic daily Assahra Al-Maghrebiya and Thami Ghorfi, general director of “l'Institut Supérieur du Commerce et des Affaires” (Higher Institute of Commerce and Business). A number of presentations were scheduled to discuss the progress made in the project in terms of construction, infrastructure, engineering, and funds. Said El-Hadi, director general of TMSA said the “Tangier-Med project aims to position Morocco as a logistic platform for the European market. TMSA, an entity in charge of the Tangier-Med port, "has secured MAD 5 billion: a US $100 million grant and a US $ 200 million credit from the Abu Dhabi Fund, and a MAD 2 billion grant from the Hassan II Fund." “We are proud of the engineers who have worked on this project. They have managed to absorb and apply the cutting-edge technology that was not available so far in our country and the rest of the Arab world,” said Mohammed Halab, Wali of the Tangier-Tetouan region yesterday at the opening ceremony of the meeting. Mohammed M'barki, the Wali of Tetouan, also considered the Tangier-Med port not only a local but a national project, in view of the amount of investments, the rhythm of achievements and the techniques used. However, he regretted that a great number of Moroccan investors were absent. Abdul Salam Al Jassimi, director of the Dubai-based Jbel Ali Free Zone International (JAFZI), gave a presentation on Jbel Ali port, with which Morocco had recently signed a cooperation agreement. Al Jassimi invited Moroccan investors to pay a visit to the port to benefit from JAFZI's 20 year experience in port management. Dubai's vast Jebel Ali Free Trade Zone now houses more than 950 international operations, most of which engage in the distribution of light to medium manufacturing products for domestic consumption and export. The Zone is built around the Dubai Port Authority's Jebel Ali Terminal and enables customers to take full advantage of the port's ISO-certified container and general cargo operations. A Free Zone Authority helps in administrative proceedings. “Dubai's 20 year experience with the Jbel Ali port is an asset when it comes to organizing activities within Tanger-Med,” he added. Al Jassimi thinks Morocco's vision was unique when it decided to launch this project, adding that it will pave the way for foreign investment in Morocco. “The investment culture in Morocco is very encouraging. Several big companies are coming to establish their offices here,” he added. 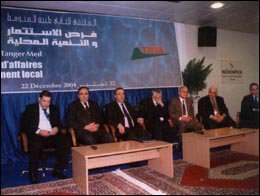 The cooperation agreement between TMSA and the JAFZI was signed on October 11, 2004 under the High patronage of HM King Mohammed VI. The 10 year agreement between both companies will create a strategic partnership that will make it possible for two geographically complementary platforms to combine their respective assets and offer investors the best possible operating conditions. The promoters of this huge project expect this partnership will enable Tanger-Med to reach its objectives: one billion Euros in private investments and an added value of 250 million Euros. This enterprising project is targeting a proximity market of over 600 million consumers, including Western Europe, Western Africa, North Africa and North America. By 2020, Tanger-Med is expected to reach a container traffic of 3 million TEU, and employ 145,000 people. The recommendations of the meeting's two workshops covered several fields, from rural development, the special Tanger-Med development zone (500 km2), questions relating to the improvement of the urban environment, to the legal framework covering the Free Zones. The participants at the workshop on “The perspectives for the Moroccan economic operators” tackled – among other subjects – the logistic competitiveness of the Tanger-Med port, the economies it will generate, its impacts on tourism, industry, and services and investment in the region. The speakers were unanimous in expressing their satisfaction of the efforts undertaken by the state to put the finishing touches to the realization of the large-scale infrastructures of the special development zone. Among the recommendations are to facilitate administrative procedures for investors, train professional in the field to adapt to the needs of the market, involve Moroccan investors along with international ones for the success of this project, and restructuring free zone regulations. The recommendation also stressed the importance of creating a natural park in Jbel Moussa, a project with structural implications which should prepare the ground for eco-tourism, which is increasingly popular worldwide. The participants also called for vocational training, which should make it possible for local people to benefit from the enormous employment opportunities inherent in this project. The president of Fahs Amjra province called for an effective involvement of elected officials in promoting socio-economic development in the region. The second workshop “stakes and perspectives of local development” included presentations on the great potentialities of the Tanger-Med region and the measures to be taken to ensure its balanced and integrated development. Participants made several proposals to improve agriculture, tourism, and fisheries. Abdelaziz Meziane Belfikh, Counsellor to His Majesty announced Wednesday in Tangiers the forthcoming creation of a development council of the Tanger-Med zone. Speaking at the end of the second Tanger-Med meeting,” Belfikh explained that this authority aimed to initiate dialogue and cooperation between those responsible for the Tanger-Med project and the different local partners concerning the socio-economic projects which will be carried out in the Tanger-Tetouan region. A cooperation agreement was singed at the closing ceremony between TMSA and Abdelmalek Essadi University to promote the development of this project and to exchange expertise especially in the field of engineering. The closing ceremony was attended by Karim Ghellab, Minister of Equipment and Transport; Rachid Talbi El Alami, Minister delegate to the prime minister in charge of economic and general affairs; Driss Benhima, Director General of “Agence de Promotion et de Development des prefectures et provinces du Nord; Dahman Derham, Mayor of Tangier; Abdelaziz Meziane Belfkih, His Majesty counsellor, Said Elhadi, director general of TMSA and others. The Tangier Med project is a strategic priority for the economic and social development of Morocco's Northern region. The project is in its broad sense the concrete manifestation of Morocco's liberal economic policy, designed to attract foreign investments, create job opportunities and reinforce economic growth.